'Twas a showery August weekend in the Lake District this year that we completed our first big (more than 2 pitch) trad route. 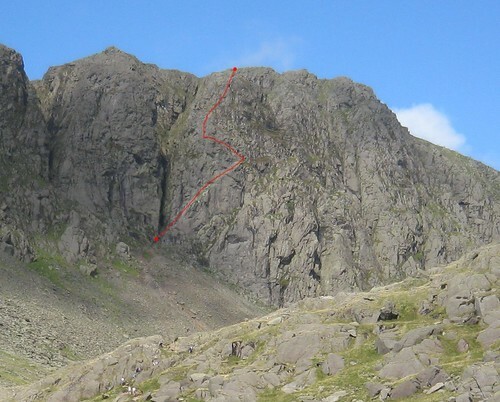 Giant's Crawl on Dow Crag near Coniston is highlighted in the guide book as being the best Diff in the country; what more could we want of a technically easy introduction to the art of multi-pitch trad climbing! Climbing as two pairs, it took us about 2 hours to do the 5-7 pitches (some can be stuck together), 120m, from the start at bottom left of B Buttress above Goats Water to the top at the Dow Crag summit. It had rained heavily the previous day, so although the sunshine had dried most of the rock, there were a few moist patches where water was seeping out of the face. Just what we needed to get the nerves tingling a little on the first couple of pitches! I'd popped into a climbing shop in Ambleside before driving over to Coniston, and was glad of the extra cam, hex, and 60cm slings I picked up there. A rack totalling 1-10 nuts, size 2 and 3 1/2 cams, a couple of hexes, and a generous number of slings was just about right. Passing the crux, an exposed rock-over on pitch 3, we make rapid progress and finished the grassy final pitch with smiles on our faces and very shaky legs. Yes, so it wasn't technically hard, but it still felt like a great achievement, and hopefully it'll pave the way to greater things.